find me a pirate who drinks this stuff ! The orange notes are very too present. Maybe on the rocks. But not for me. Back in 2005, I was mostly a Cognac guy with the occasional ultra premium Tequila and Scotch added for some variety. I was offered this particular rum by a bartender at Cuba Libre near Downtown Dallas to try. It was certainly better than any rum I had ever tried! But I was use to the typical Bacardi, Captain Morgans of the world. It is for all purposes, a nice starter rum if that is all available at the bar. It is sippable , but has bite. Not very complex. I actually believe it makes a nice mixer if anything. quite expensive, quite unpleasant, Bacardi with some orange peel soaked in it. never again. Very specific combination of so much citrus (in nose and the mouth) and still pretty harsh taste gives personality to this rum and I like that. It is very easy to describe to others yet its not boring to drink. It is not the Best rum. However not the worst either. It is drinkable, but not more. This is my go to Rum. It has a great flavor that doesn't kill drink tasting nor does it taste like it was a syrup. I am new to the Rum game (have done mostly whisky until now) and have only tried a few but I like to have my cheaper go to drink and some good high end drinks. This fits the cheaper go to standard for parties and just a good drink for the house. I like the uniqueness, the impossible-to-miss taste and smell of orange. It is also a good starter to a nice evening with degustation - it's has a standalone taste. Sviezi, pomarancovy, menej vyrazny rumik s nadhernou dochutou. A friend of mine told that this was one of the best Rums he had ever tasted. Im not sure about his current medication or maybe the one he had tasted was from the previous distillery. Basically only flavour I could taste was too much orange. Needs time to breathe. The store clerk told me Bacardi is taking over this company.Packaging is effective and eye catching with the miniature wooden barrel. It was marked down to $24 from $34 in order to eliminate the inventory. I found it to be quite smooth, perhaps a bit on the sweet side. This one I like the most, smooth, sweet, full of taste. Amazing rum, hope to find a similar one. Pyrat Rum XO is een heerlijke donkere rum met een prachtig, uitgebalanceerd smakenpalet die zowel verfijnd als complex is. Bij Pyrat is kwaliteit niet een keuze maar is het de standaard, elke fles van dit prachtige product word met de hand gevuld en met de hand gelabeld bij de brouwerij in Anguilla. De rum is zijdezacht en drinkt heerlijk weg en wordt omringd door zalige aroma’s van vanille, kaneel en bruine suiker. Complex en elegant tegelijk, een aanrader voor elke rumdrinker! Not sure why people are giving this such high marks. First off, the smell will make you cringe. Smells of alcohol, and more burning alcohol, with a very minor vanilla or nutmeg smell. Tasting it is even worse. It burns your tongue and the inside of your mouth. I can't taste anything but the charred wood and burning alcohol going down. Even burns and leaves a nasty bitter after taste. If you burp, it all comes back. This is supposed to have orange or citrus flavor in it according to other reviews. Some say it was overwhelming citrus, but I can't taste anything orange or citrus in this crap. I even let it breathe like it was suggested in another post. No difference. I try my hardest to be honest when I review stuff. This is $25 wasted and the biggest buying remorse ever. Wish I could get my money back or at least a partial refund. Steer clear at all cost. I don't expect greatness from Patron in general, but drinkability at a decent price is expected. Not so. This is a sad excuse for a rum. It tastes more like a lightly spiced triple-sec than anything else... I may experiment with it thusly in mixed drinks to make use of the rest of it. I'll try revisiting it at some point with low expectations, but somehow I'm still not hopeful. At least the bottle is nice? En god anderledes rom, med en smag og duft af appelsin. Kan kan godt lide at den er anderledes og helt sin egen. I did a blind taste test between this and the Pyrat Cask 1623, neither of which I had tried before. One smelled like an orange rum, the other like an orange liquor. This was the orange rum. This tasted better to me. How did this even get a 6? Like every fine sailor I will drink just about anything. Oh, but not Pyrat. Horrible, horrible, horrible. Patron makes this? No wonder. Try again tomorrow. I'm shivering in my timbers just thinking about it. 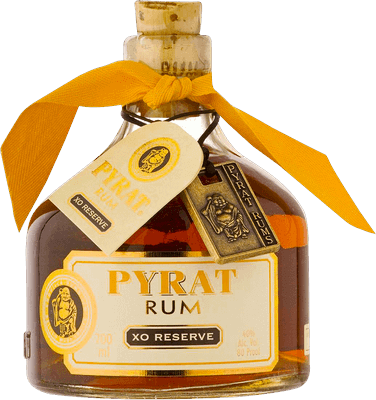 (I prefer Pyrat xo over board) This pyrat should walk the plank. I'm glad I only spent $8 for a 375 mL. I don't get all the hype and will align myself with those who think this stuff should more appropriately fill my Zippo. I will agree it gets better as it sits, but why should you have wait? Meget dårligt er der skrevet og sagt om denne rom, så jeg måtte da se om der var noget om det. Bevares appelsinen kan man ikke slippe af med. Men den adskiller sig fra alle andre rom, hvilket jeg mener er go' ting. I enjoyed it as a sipping rum, although the flavors could be very overwhelming. It went down smooth, and it was sweet, but the vanilla and orange were definitely present. If nothing else, the smoothness made it easier to drink, and I would get it again. Sugar: 24 gpl. This rum has a strong flavor similar to the Cognac taste found in Gran Marnier. I didn't like it mixed with coke or anything else and struggled to finish using the bottle, so I gave it away. There are much nicer tasting rums for mixing. The bottle looks nice on the shelf, but you can get a cheaper vase at IKEA. The factory have never exist There were never made Rum on this little cayman before, but it is a good (promotion) story.